In business, we sometimes get too caught up in the idea that we need to be different, to innovate. We do need to distinguish ourselves, but that does not mean we can’t borrow ideas, make them our own, and do an even better job of executing them. Yum! Brands CEO David Novak shares how pattern thinking has helped generate amazing ideas–including the Cool Ranch Dorito. When faced with trying to accomplish a big goal, one of the most daunting questions is: Where do I start? “Standing on the shoulders of giants” is another way of saying you don’t have to start from scratch and you don’t need to reinvent the wheel. In business, we sometimes get too caught up in the idea that we need to be different, that we need to innovate. Of course we need to distinguish ourselves from the competition, but that does not mean we can’t borrow good ideas, make them our own, and do an even better job of executing them. Pattern thinking, where you look at what’s working for someone else and apply it to your own situation, is one of the best ways to make big things happen for you and your team. 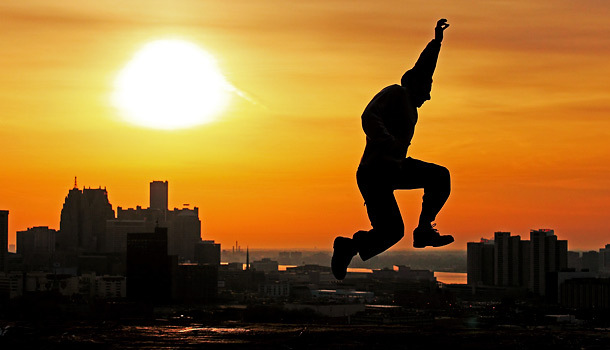 Combining the knowledge of others with what you know about your brand and industry can lead to results that are more than just incremental improvements, they can help you take a giant leap forward. One example of this happened early in my career when I was head of the Frito-Lay account, which included Nacho Cheese Doritos, at my ad agency. One day I decided to take my team to the grocery store to look around and get some ideas. What was surprising was how much time we spent, not by the snack foods, but in the salad dressing aisle. Ranch dressing was far and away the best seller in the category at the time. That gave my team and me an idea: Would ranch dressing work as a chip flavor? We went to Frito-Lay with the concept, but then it became a matter of how to position it. So I looked at what had worked for Nacho Cheese Doritos. They had applied a unique image–nacho–to a known quantity–cheese–to make a product that was both exciting and appealing at the same time. So I asked, “How can we do the same thing for our ranch-dressing-flavored tortilla chip? How can we give a bit of uniqueness to the known quantity, which was ranch dressing?” That eventually led to Cool Ranch Doritos, which is now one of Frito-Lay’s biggest-selling and most profitable products. Pattern thinking requires that you keep your eyes open and actively seek out new ideas wherever you can find them. And you won’t truly have your eyes open unless you have enough humility to admit that the best ideas aren’t always going to come from you. To take advantage of our unique position of being a brand-new public company made up of well-established brands, we did a best-practice tour of some of the most successful companies around at the time in order to take inspiration from them and borrow any good ideas we could find. We visited seven companies in all–GE, Walmart, Home Depot, Southwest Airlines, Target, Coke, and UPS–and then came back and crystallized what we’d learned into five things that we called our “Dynasty Drivers.” These were the things that we believed would make us an enduringly great company and included: A Company Where Everyone Makes a Difference; Customer and Sales Mania; Competitive Brand Differentiation; Continuity in People and Process; and Consistency in Results. That early best-practices tour gave our company a base of knowledge and a focus that we have been building on ever since. It really reinforced the idea in our company that, for any problem we need to solve, learning all we can about it is the best place to start. There is always more to know, and when people ask me what I look for when hiring someone, an avid learner tops the list. People who are avid learners love what they do and seek out know-how wherever they can find it, which makes them a whole lot smarter and their results a whole lot better. 1. Eliminate “not invented here.” The phrase “not invented here” refers to an unwillingness to adopt something because it didn’t originate with you. As leader, it’s your job to make sure that nothing gets in the way of a good idea, no matter where it comes from. 2. Act like you own the place. I don’t mean that you should act like you own the place in terms of your ego, but more in terms of how you think about the business. If you owned the company where you work, you’d be concerned with all aspects of it. You wouldn’t just think about your own role or your own department; you’d think about the total picture. Adopting this attitude will force you to look at and learn about more aspects of the business, which will give you a broader perspective. It will also demonstrate to others your potential for taking on more responsibility. 3. Keep your big goal top-of-mind. In the information age, knowledge is everywhere, so you have to be strategic about it. Have you ever noticed that when you decide which car you want to buy, you suddenly see that car everywhere you go? Well, that’s not because everyone has the same car; it’s because identifying what you want gives your brain a focus and a filter. You have to do the same for your Big Goal. Keep your antennae up and your Big Goal top-of-mind, and you will suddenly see ideas for how to reach it everywhere you look. 4. Seek out knowledge holders and sources. Be proactive about gaining knowledge by searching for expertise. Who knows something about what you’re working on? Go talk to those people. You’d be amazed how many doors you can open just by telling people you’d like to learn from them. In addition, where can you find information about what you’re working on? Go look up those sources, whether they are case studies, books, business magazines or what have you. Being open to and on the lookout for good ideas yourself is only half that battle. You have to position yourself so that good ideas can come to you. That means creating an atmosphere in which the people around you feel comfortable speaking up and know that there is a benefit in doing so. If you want to take people with you and accomplish your Big Goal more efficiently and effectively, you need to learn to see every person and every experience as an opportunity to expand your knowledge base. As Sir Isaac Newton once said, “If I have seen further, it is by standing on the shoulders of giants.” I love that quote and wholeheartedly agree, but I would go one more: You will see even further if you stand on the giants’ shoulders and take pride in crediting and thanking them for the view. David Novak is the chairman and CEO of Yum! 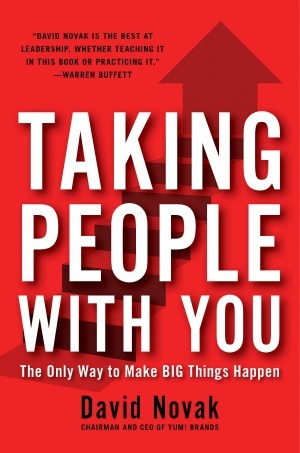 Brands, Inc.; this article is adapted from his new book, TAKING PEOPLE WITH YOU: The Only Way to Make BIG Things Happen.